Dril-Quip’s European Headquarters, established in 1986, are located in a purpose-built facility on a 21.8-acre site in the town of Dyce, a suburb of Aberdeen, Scotland. The facility is divided into two sections known as Stoneywood North and Stoneywood South (see below), whose aggregate building space totals 244,712 square feet, with 650,600 square feet of yard area. The European Headquarters oversees operations throughout Europe and Africa. 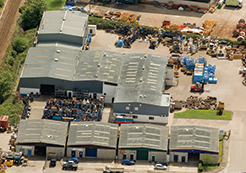 The Administrative, Sales and Engineering staff of Dril-Quip Europe are presently housed in two adjacent buildings on the Stoneywood North campus. Also located in this area are the Project Management, Finance, Human Resources, Information Technology and Quality Control departments. Total office space dedicated to these departments equals 27,336 square feet. At a satellite location not far from the European headquarters, a Wellhead facility has been established on 2.3 acres of land. The group of buildings on this property provide 6,798 square feet of office space and 48,250 square feet of shop space dedicated to sales, service and reconditioning of Dril-Quip’s Wellhead product line. There is also 40,000 square feet of yard for storage of equipment. The 35,945-square-foot Finish Machine Building includes a full range of computer-controlled machines (programmed-in-house) utilizing three-dimensional CNC programming software, and manual machines. The machines are capable of manufacturing the full range of Dril-Quip products. The Test and Assembly Building provides a shop floor area of 8,698 square feet. Two overhead cranes serve the building, each with a safe working load of 33 tons (30 tonnes) and with a height from factory floor to crane hook of 45 feet (13.5 meters). A large testing pit, 60 feet (18 meters) long by 20 feet (6 meters) wide and 20 feet (6 meters) deep, facilitates assembly and safe pressure testing. Enhancing the facility’s capabilities is a steel tank sized to hold a dual bore subsea tree assembly that can be located in the test pit for carrying out high-pressure nitrogen gas testing. There is also a 7,000-square-foot dedicated Assembly and Testing High Bay suitable for safely conducting all pressure and stack-up testing for subsea production trees. Dril-Quip Europe’s fabrication facilities consist of the 13,203-square-foot General Fabrication Shop and the state-of-the-art Tubular Welding Shop of 26,900 square feet. 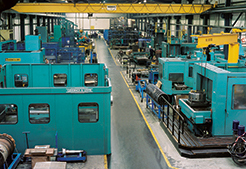 The Tubular Shop features two production lines that are designed to provide a continuous production process. This allows Dril-Quip Europe to perform a complete scope of work in the fabrication of tubular conductors. Dril-Quip Aberdeen’s Stoneywood South facility consists of one major 88,690-square-foot office building, occupied by administrative and engineering personnel, and a three-bay, 37,580-square-foot shop building that provides space for various manufacturing processes. 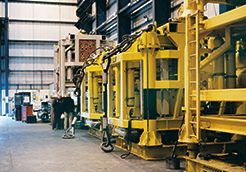 Manufacturing of Subsea Control products is handled from this facility. This facility is equipped with a Fluid Cleanliness Measurement Station, Hydrostatic Pressure Test Booth, Portable Electric Test Units, Subsea Control Module Test Stands, EFL Test Connectors and HFL Test Stands. A work area is provided for the construction of subsea distribution units, tube welding, x-ray NDT, flushing and pressure testing. Externally, there is concrete yard space that can be used for carrying out full subsea system integration, including interfacing to subsea trees, manifolds or HIPP units, and verification of IWOCS interfacing with trees or EDP/LRP units. For more information you can view a comprehensive, printer-friendly, listing of All Dril-Quip Locations.